Among the various backpacking items, hiking pants are very important. As simple as they may seem, pants and other clothing can be challenging to buy. Therefore, there are several things that you must take into consideration before you are able to buy the best winter hiking pants. You need at least two pairs of trekking pants. The best buy is always defined by its features, which can include anything from the fabric, reflective details, synthetic lining, water and wind resistance to eco insulation. The list of product reviews provides useful buying information, and tips for future purchases. 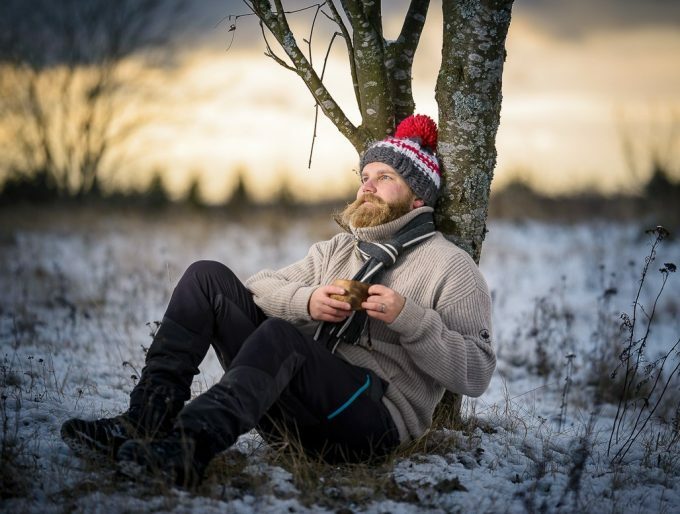 The best pants are usually made of synthetic materials, which are very effective for keeping you dry and warm as you go about your activities during winter. The soft cotton material may sound appealing to some individuals, but there are several drawbacks. Cotton pants are known to trap moisture and sweat; therefore, they will keep you wet and cold instead of dry and warm. Apart from being very uncomfortable, they lack insulation. Consequently, you will feel the cold, and you may end up getting chills when hiking and camping during winter or on higher grounds. One of the most recommended fabrics is ripstop nylon. Most of the reviewed products in this publication are made of this material because of its unique design characteristics. It is 100% nylon, which is exceptionally woven, making it highly abrasion and tear resistant. This fabric does not tear or puncture easily even if you are climbing a mountain. Ripstop nylon has reliable waterproof capabilities. You should not be worried about water droplets wetting your legs because the fabric will keep the water off the base of the pants. You can get the fabric right, but make a poor choice with respect to ergonomics of the pants. They should be properly insulated. The best insulations include:80g thermal.q elite; PrimaLoft Eco; 750 fill down; and 60g Coreloft insulation materials. Most of these insulation materials are composed of 50% recycled fibers, which make them highly water resistant, fast-drying, and thermally efficient. Most shells are made of ripstop nylon, but you should be careful with the lining, since some are made of cheap materials. Choose a lining material that will feel comfortable with your skin. 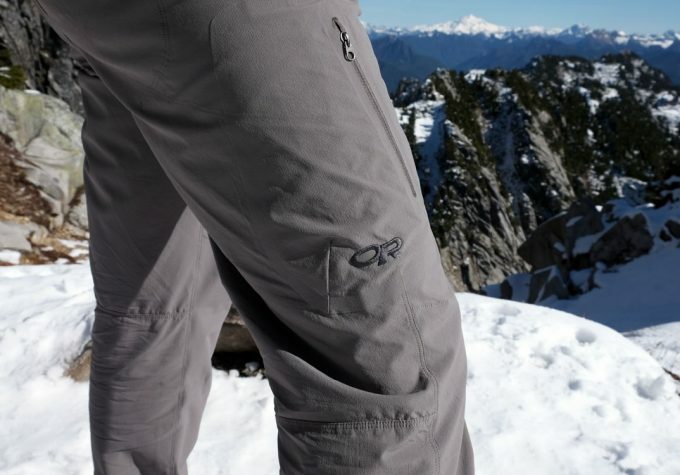 The best cold weather hiking pants are lightweight. You do not need bulky legwear when mountaineering. They need to be compressible and packable apart from being lightweight. You need slacks that you can easily fold and backpack without consuming extra space. They should be fitted with full length size zips, which allow for easy removal over your boots as well as crampons. The side zippers improve ventilation and they also make it easy for you to get in and out of the pants. Other beneficial features include: stow pocket, bottom snap enclosure, and articulated knees & seat. Mountain hardware compressor pants are highly compressible and lightweight, making them the most ideal choice for outdoor adventures, especially during winter. They weigh only 1 lb. 2 oz. Therefore, they are ultra-lightweight. You will not feel any added weight on you when they are on, making them ideal for long distance hiking and climbing among other activities. You will also not feel the added weight when you backpack them. They are made of 20D nylon ripstop material, which has a long lasting water resistant treatment, along with low weight and great feel. This material is known to do well when exposed to outdoor environs, because it does more than just keep you dressed in pants. The design is incorporated with 80g thermal.q elite insulation that keeps you warm irrespective of the weight. It is fitted with reinforced seat & knees. This ensures that the pants are able to withstand grazing when you are in high abrasion areas. You will like the adjustable elastic waist along with the attached webbing belt. You can tighten or loosen the grip on your waist, conveniently.A quickchange of pants and ventilation are easy because of the side zippered legs. Generally, the pants are easy, comfortable, and warm to wear. They will fit you easily, all you have to do is zip or unzip the side legs so as your legs can effortlessly push through. 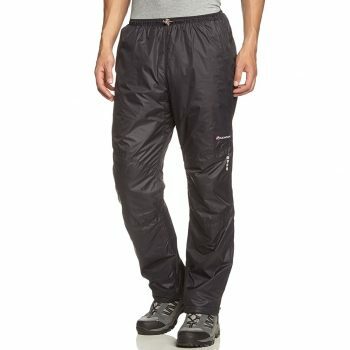 Pants Features: Standard fit; 100% 30D nylon ripstop fabric; 100% nylon taffeta lining; dual sliding zipper fly; zip thigh pocket; double separating side zippers; PrimaLoft Eco insulation; articulated knees & internal cuffs; integrated belt; wind and water resistant. Outdoor research men’s Neoplume dacks are the best for hiking in winter, and long distance backpacking expeditions. These pants have done extremely well in harsh weather conditions. You do not have to run away from the cold that winter throws at you. Instead, you should pull this pair from your bag and wear it to insulate yourself. The pair measures 34 inches from the crotch down the inner seam to the bottom. The pair is made from 100% 30D nylon ripstop, which is extremely lightweight and long lasting. The fabric’s lightweight nature does not compromise the durability as well as theperformance of the pants. In actual fact, the fabric is coated for wind and water resistance. The outer layer is treated, ensuring that water droplets do not wet the base fabric. The ripstop outline is moderately subtle, and sleek but not shiny. The 100% nylon taffeta lining is particularly comfy against the skin. The fly zips and double separating side zippers are shielded by flaps on the inside. The elastic back waistband ensures that they fit you effortlessly. You will admire the substantial fleece-lined pockets with full zipper. They make sure that items do not fall off while hiking or climbing. You will be amazed at how thin and comfortable these slacks feel. By and large, Outdoor Research Neoplume Insulated Pants are highly resourceful and versatile in cold temperatures when compared to most products in the market. Pants Features: Material (100% recycled mesh lining, Durastretch superlight panels, & 100% nylon ripstop DWR main design), Polartec Alpha (60g) insulation, 1 zippered thigh pocket, athletic/articulated knees, full length side zippers, hem reinforcement, clip integration w/ Mezzalama jacket, & water resistant ripstop shell. 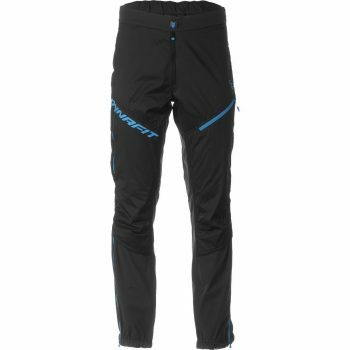 The Dynafit Mezzalama Alpha pants are highly versatile, insulated denim for extreme weather conditions. They are shielded with Polartec Alpha (60g) insulation, which is a highly reliable synthetic material. The insulating material is circulated in the slacks, providing you with slightly higher weight at the waist downwards, and a lighter weight at the knee downwards. This provides you with endless warmth whenever you need it, while out there hiking, camping, or climbing. 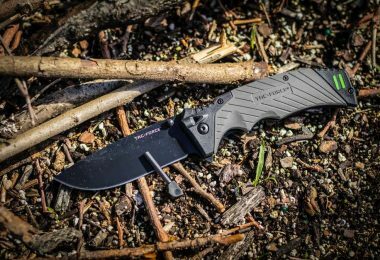 The shell of Dynafit Mezzalama Alpha is made from 100% nylon ripstop DWR. The ripstop DWR nylon fabric is exceptional. 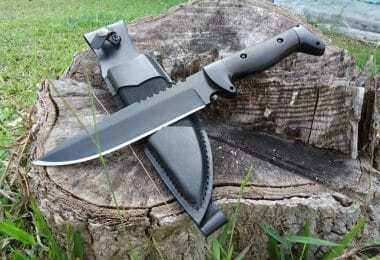 It is fairly lightweight, offers amazing tensile strength, and highly versatile. The fabric provides superior water repellency under any given weather conditions. This particular pair is made for Italian high altitude, especially for ski mountaineering. Therefore, it is just the pair you need when the weather is unbelievably cold. These pants are fitted with Durastretch Superlight panels that shield your knees as well as cuffs for stretched mobility, durability, and consistency when on the move or climbing. The slim-fitting design is incorporated with articulated knees for improved mobility. In addition, they come with full-length side zippers for effortless dressing and ventilation. You will hardly feel any excess heat on your skin, since you can easily unzip the side zippers to allow air in for effective ventilation. You will certainly admire the clip at the waist level, which does conveniently connect to the Dynafit Mezzalama Jacket. 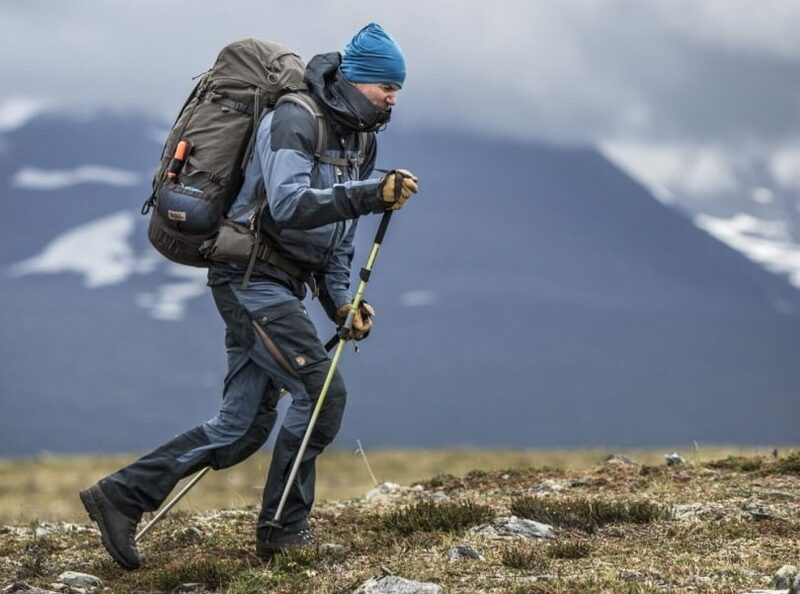 Pants Features: PERTEX Microlight Rip-stop; PRIMALOFT (40g) silver Eco insulation; PEAQ synthetic lining; MONTANE stuff sac; reflective details; press stud ankle adjustment; 1/4 length side leg zipper; articulated knees & diamond crotch; and lifetime warranty. The Prism running pants by Montane are exceptional backpacking legwear for extreme weather conditions, and post exercise. They are the best as far as insulating your legs is concerned. You can wear a pair after training for alpine insulation, and warmth. The main fabric used is made of PERTEX Microlight Ripstop. PERTEX Microlight fabric is balanced and lightweight for effective weather protection. It is highly abrasion and water resistant and long lasting. Unlike most fabrics, this one is waterproof, windproof, stable downproof construction, and soft to the touch. The insulation technology used is PRIMALOFT Eco 40g, which provides you amazing compressibility, great water resistance, and remarkable warmth at all times. The pants design is incorporated with 3M Scothlite reflectivity technology that reflects light, thus ensuring you are visible and safe all through the night. You are provided with lower side leg zippers that you can unzip for improved ventilation. High step movement is easy because of the diamond crotch and articulated knees. There is an elasticated hem that is fitted with shock cord adjustment. The combination of PEAQ synthetic lining, DWR treatment, and PERTEX Microlight shell make the pants highly durable, exhibiting reliable abrasion resistance. This is a guarantee that the trousers will not snag or tear when climbing or moving through thickets on the trail. 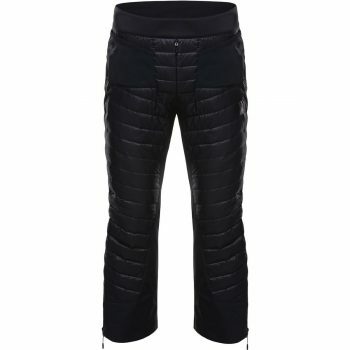 Commonly, the pants will provide you remarkable warmth for any outdoor activity. 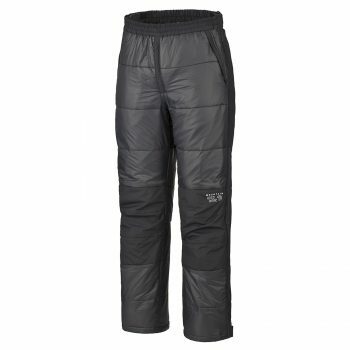 Pants Features: Cordura w/ Cordura stretch panels; 750 fill down insulation; full length side zippers; 3/4 length fit; double down chamber construction; and hydrophobic goose down insulation. Black Yak PALI pants are among the best mountaineering, alpine camping, or backcountry touring slacks for the money. This is the right puffy pair for an adventurous winter expedition. They are made of Cordura fabric, which is well-known for its unique characteristics. The shell material (Cordura) has been validated, ensuring that it meets the sturdiness as well as quality standards for winter hiking. The material is very effective as far as resourcefulness, reliability, versatility, and durability are concerned. 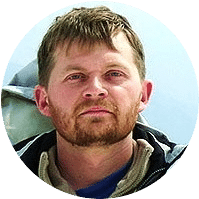 They are incorporated with hydrophobic goose down insulation, which offers extraordinary warmth and compressibility (allows for easy packing into expedition duffel bags and ski packs). The down insulation provides remarkable thermal qualities, contains small pockets of air, and has reliable lofting qualities, which collectively form a thermal barrier. You should not be concerned about cold spots because the double down chamber structure disregards any cold spots. 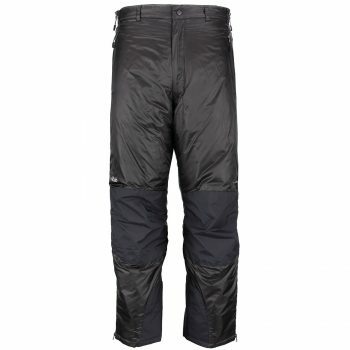 These trousers are a perfect design for mountaineering since they provide 3/4 length fit, which is sufficient for skiing as well as mountaineering boots.The pants are highly stretchable for free movement when climbing or when on the trail. These are the pants to buy if you are after clothing gear that will keep you going uphill without feeling the effects of the cold weather. Pants Features: Outer fabric PERTEX Microlight; inner fabric 100% nylon ripstop; PrimaLoft gold insulation; stuff sack; snap hem closure; belt loops; elasticated rear waistband; snap waist closure; 2 YKK zipped hand warmer pockets; YKK zipped fly; internal insulated zip baffle; full length YKK separating side zippers; reinforced kick, knees, and seat patches. Designed particularly for outdoors, Rab Photon pants are exactly what you need for winter hiking, camping, climbing, and backpacking. The outer fabric is made of PERTEX Microlight, which is a durable material with the following properties: more breathing ability, wind resistance, waterproof, and highly versatile. The inner fabric is made of 100% nylon ripstop with improved tensile strength and versatility. The ripstop inner fabric is not easily punctured as most people would imagine. 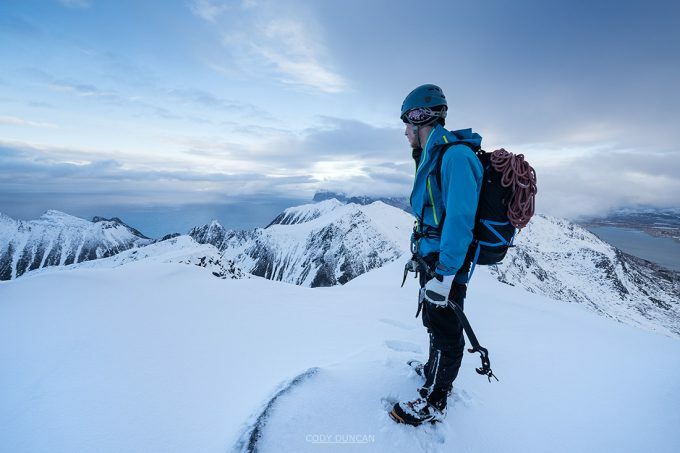 The pants are incorporated with PrimaLoft gold insulation that ensures you stay warm at all times regardless of whether you are skiing, mountaineering, camping, or hiking. The 2 YKK zipped hand warmer pockets provide you with means of warming your hands, and enough storage for small items. The zip fly simplifies things when going for a short call. The YKK full length separating side zippers provide means of unzipping the trousers for ventilation and effortless dressing. You should not be worried that you will abuse the pants when hiking, climbing, or running because the reinforced kick, knees, and seat patches offer added durability. These trousers are highly insulated; therefore, they are the best for winter or outdoor activities that involve less of trekking. A feature unique to these pants is the side zippers, which open bottom to top and vice versa. 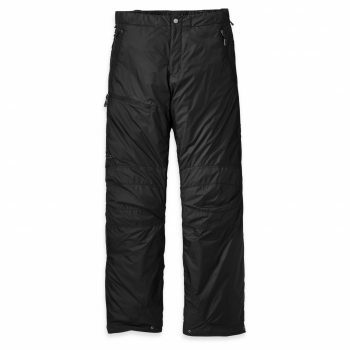 Pants Features: Tinthan nylon material (DWR treatment); 60g Coreloft insulation; regular fit; 1 stow pocket; elasticized waist; full length side zippers; articulated knees & seat; and trim fit. 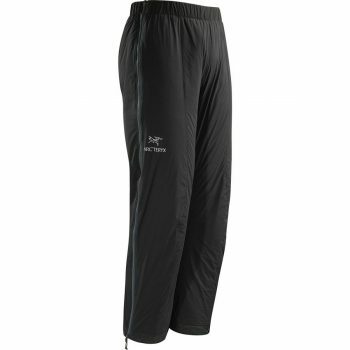 Arc’teryx pants are one of the most lightweight winter hiking, camping, and alpine legwear. The outer part is made of Tinthan nylon material with DWR treatment. This material is highly breathable, well-insulated, moisture-proof, wind resistant, and compressible. It has 60g Coreloft insulation that ensures you stay warm. With the articulated design, you can ski or climb uphill unswervingly. The full length side zips simplify the dressing process, you can quickly get in and out of the pants in a matter of seconds. There is a stow pocket situated internally with an attachment point. Its compressibility and packable nature make them the ideal choice for backpacking. Generally, they are warm and comfortable to wear. You will be very pleased with the ergonomics of these pants. 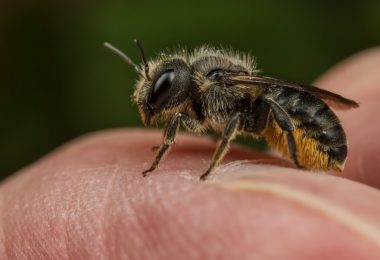 In actual fact, you will end up buying a number of them for your outdoor adventures. You need to buy durable hiking pants that you will use for a considerable amount of time. The best design should have a lightweight shell, reliable reflective details, properly insulated, fully compressible and packable, full length side zippers, articulated knees and seat, and stow pocket among other features. Generally, the pants have to feel comfortable when you wear them. This way, you will be able to go about your activities comfortably. The most important features and the product reviews should help you make the best purchase. Do you think we have missed any resourceful hiking pants? If so, let us know in comments.